Memorial service will be held at 2:00PM on Thursday, February 7, 2019 at St. Paul's United Church, Morden. Viewing will be from 1PM-6PM on Tuesday at Wiebe Funeral Chapel, Morden. Cremation to follow with ash interment at Chapel Cemetery at a later date. If friends so desire, donations may be made in Dale's memory to the Boundary Trails Health Centre Foundation (designated to Palliative Care) or to the Heart & Stroke Foundation of Manitoba. 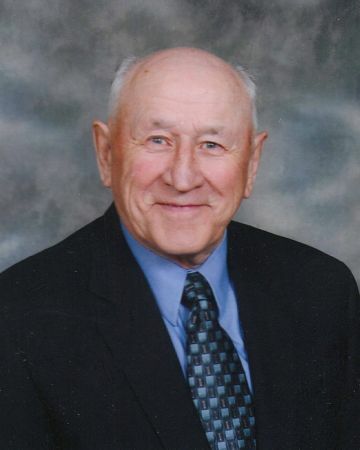 Dale, as he preferred to be called, of Morden, Manitoba, died suddenly on the afternoon of February 1st at the Boundary Trails Health Centre as he was preparing to come home. His wife Phyllis and son Gil were both by his side helping him to dress. Dale was born in the family farmhouse in 2-6 in the Pearce District to Alexander and Cecelia (Aspevig) Dudgeon. Dale attended Pearce and Alexandria School’s and also Morden Collegiate. Dale began his career driving cab in the City of Winnipeg, during which time he married his childhood sweetheart Phyllis (Neighbour), and their first son Gil was born. In 1961 Dale was asked if he would like to take over the Neighbour family farm and he jumped at the chance because of his great love of the land. He spent the rest of his life as a successful farmer, continuing to help with the field work annually even after he retired. He operated a seed cleaning business on the yard called Upper Lye Seeds beginning in 1977 and was a member of the Canadian Seed Growers Association his entire career. Dale was very active in the local community including time as a member of the Darlingford Community Centre, Darlingford Curling Club Committee, Memorial Park Committee, Zion-Calvin United Church Board and the Darlingford Centennial Committee. He was also a Cub and Scout Leader for 10-12 years. In later years he was an active member of St. Paul’s United Church in Morden. Dale’s love of the land also extended to his hunting and fishing, and he especially enjoyed his trips to the fishing camp on the Winnipeg River. He also loved sports, particularly fastball when he was younger, and curling his entire life. He loved games such as pool and card games of all kinds. He loved dancing and music, playing fiddle, ukulele and piano, and raising three musical children. He also became an avid reader especially of history, after retirement to Morden. Dale will be forever remembered and sadly missed by his wife of 59 years, Phyllis (Neighbour) and by his son, Gil (Linda Hiebert), granddaughter, Robin (Ken Helstrom), great-granddaughter, Abigail (Helstrom), grandson, Alexander, son, Roy, daughter, Marylee (Kathy Steele) and many nieces and nephews. Dale is survived by his sisters-in-law, Marion, Lorraine, Elizabeth (Gilson) and Carol (Davies). Dale was predeceased by his sister, Eileen (Jack Laing), brothers, Ole (Velma), Allan and Arthur, niece, Judy (Hoes) and great niece, Taylor (Christie). Memorial service at 2:00 p.m. on Thursday February 7, 2019 at St. Paul’s United Church in Morden, with interment at a later date. The family wishes to gratefully thank our Church Community and friends who reached out and supported us with prayers and visits, and the staff at Boundary Trails Health Centre. If friends so desire donations may be made in Dale’s memory to the Boundary Trails Health Centre Foundation (designated to Palliative Care) or to the Heart and Stroke Foundation of Manitoba. So sorry to hear of Dales passing. Had a good talk with him at the hospital last week. Will miss him calling bingo. Rest In Peace. Our thoughts & prayers Phyllis to you & your family. Dale was a great guy & will be missed by all who knew him. Our condolences.Cherish the memories. So sorry to hear of Dale's passing. We will miss him at the library. Definitely saddened to hear of the passing of the man I referred to Uncle Dale. My sincere condolences to the entire family and relatives. I’ll always remember him from the many visits to Morden to visit all relatives. I guess he’s up in heaven with Allan, Artie, Ole the rest of the gang playing baseball and telling jokes. Deepest sympathy to all of Dale's family. He lived his life well and was always great to talk to. Cherish all your memories. Dear Phyllis , Gil , Roy , Marylee and family . I'm so very sorry for your loss of dear Dale. It was so good to talk to you Gil last week about your dear Dad and much of the Dudgeon family. I was looking forward to seeing Dale after his time in the Hospital. I really appreciated talking with Dale though the times were few and far between . I wish all the very best to you Phyllis and family and hope the heavy hearts you have with your grief now will soon fade and beautiful memories will prevail. Marylee, so sorry to hear of your Dad's passing. Thinking of you in your time of need. Phyllis and family, we are so sorry to hear of Dale's passing. He will be especially missed at the Morden Curling rink and the Morden Activity Centre. Marylee, I am so sorry to hear about your dad's passing. My condolences to you and your family. Deepest condolences to Dale's family. Seems just like the other day I met Dale at GT and we had a great conversation as usual. We will Miss Him. Mother D, Marylee, Roy and Gill. We are saddened by the loss of Dale. He was such a memorable person. Always kind, and quick with a joke. He worked hard all his life and raised three wonderful children. He will be dearly missed. Condolences from his family on the rock. Our condolences Phyliss and Gil. Always enjoyed chatting with Dale. He had story no matter what. Mrs. Dudgeon, Gill, Roy and Marylee: We are sare sorry to hear of Dale's passing. Thinking of you at this time. Our sincere sympathy Phyllis, Gil, Marylee, Roy and family. Our hearts go out to you! Dale was a terrific guy. Murray has such great memories being with Dale, and all the fishing buddies at the cabin. Plus the many coffees at Darlingford and also the curling rink. He will be so missed! I am saddened to hear of the passing of another one of the Eaglenest Cabin Family. I know how much enjoyment Dale would have with his Crew when they went up the river. I will miss sharing fishing stories with him. The excitement in his voice over the phone about the huge fish that got away. Or better yet, the one that didn't get away. I think the time has come for a cabin wall to be used for a few pictures. In honour of our Historical Cabin Family. Gill, I share your feelings. This summer I will be taking a moment of silence to honour your Father Dale Dudgeon. For all the good things he shared with us all. Just heard of Dales passing.My sincere sympathy Phyllis and family. As Bert has mentioned We have fond memories Of the Dudgeon /Treichel relationship in the Pearce School District. It spanned many years. What great friends and neighbors! Our famous Pearce School soft ball team was mainly comprised of Dudgeons and Treichels. . Those were the good old days! May Psalm 16 comfort you. Our Sincere Condolences to Phyllis and Family. Dale was a wonderful person with such a great sense of humour and we will miss our visits while watching Curling. Sorry to hear of Dale’s passing, Phyliss. He will be missed. He was a great little cousin. My most special memory of my father will always remain the way in which he devised a way to come back from beyond the grave and tell us all how much he loved us, and how special we each were to him in our own ways, at his own funeral, by writing his own eulogy. Only a thoughtful, kind and gentleman would think of that.